This comfortable holiday home in the old heart of Noordwijk offers comfortable accommodation for two people. Enjoy the privacy of the spacious roof terrace and, of course, the nearby beach and sea. Through a little gate on one of the most beautiful streets lined with linden trees in Noordwijk, you access the inner garden adjacent to your holiday home. Comfort in excess; after the spacious hall comes the lovely living room with a nice seating area and complete open-plan kitchen. 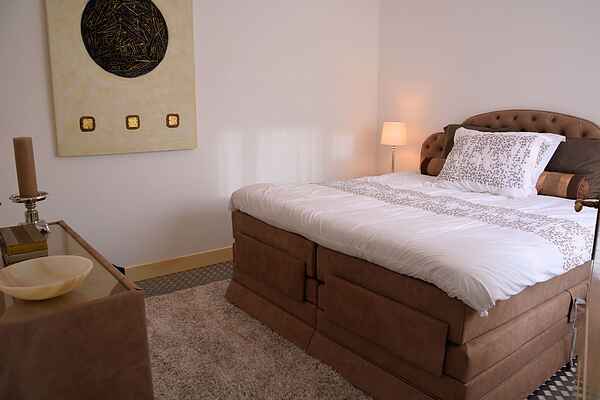 The first floor has a tastefully furnished double bedroom with two electric, adjustable box-spring beds. There is more than enough room for a crib. The modern bathroom has a walk-in shower. The icing on the cake is the excellent, furnished roof terrace. You can peacefully enjoy every ray of sunshine here. In the direct vicinity you will find shops, a supermarket and several lovely restaurants and pavement cafes. The beach and lively promenade are a few minutes away. In the spring, you can of course enjoy the flowering Bulb Region and the Keukenhof. Numerous other sights are easily accessible. Friendly cities such as Leiden, Haarlem, The Hague and Amsterdam are close by.